Under the consultation procedure, the Council can vote using qualified majority voting if necessary, however, in practice consensus is often achieved. Despite its lack of veto power within this procedure, the Parliament is not completely powerless to act in the face of legislation it opposes. 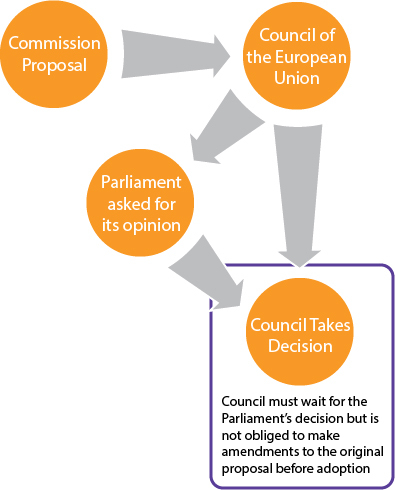 Thanks to the ‘isoglucose’ ruling of the ECJ in 1980 (case 138/79), where the ECJ stated that the Council must wait for Parliament’s opinion prior to adopting legislation; thus, Parliament has a valuable delaying power. In cases when the Parliament is unhappy with proposed legislation, it can postpone making a decision and lobby the Commission to change the proposal. This does not constitute a veto, as the Parliament is unable to withhold its opinion permanently. However it does at least make sure that the Parliament’s opinions are taken into account. Before the 1980’s and the adoption of the Single European Act, the consultation procedure was the most common form of decision making procedure in the EU. Reflecting a long term shift towards more involvement of the Parliament in decision making, the consultation procedure is now only used in a small number of areas such as internal market exemptions and the competition law.